On an African plateau surrounded by flat-topped trees as far as the eye could see, wind whistled through the acacia thorns like someone blowing across a bottle. Kathleen Rudolph was more concerned with the ants raining down on her from the trees. The hat, long sleeves and garden gloves the University of Florida researcher wore for protection didn’t help. The acacia ants she studies, Crematogaster mimosae, use their fearsome bite to defend their host trees against large animals such as elephants and giraffes that eat the trees’ leaves. Even elephants’ thick skin can’t protect them from the ants, which bite them inside their trunks. Ants are also aggressive toward each other, fighting to the death over their tree territories. While the consequences for losing colonies are stark — loss of territory or colony death — Rudolph and UF postdoctoral research associate Jay McEntee wanted to understand the costs to the winners. After a fight, victorious colonies have to defend their newly gained territory with a workforce heavily depleted by fighting. In a new study funded in part by a National Geographic Society/Waitt Fund Grant and published in Behavioral Ecology, Rudolph and McEntee found that victorious colonies might offset this challenge by recruiting members of the losing colonies to help. In experiments based at Mpala Research Centre in Kenya, researchers instigated ant wars by tying unrelated colonies’ trees together, counting casualties in tarps placed below. By simulating the browsing of a large mammal, they discovered that victorious colonies are less able to defend their host trees after fights. After analyzing the DNA of nearly 800 ants, they discovered that fighting changes the genetic make-up of victorious colonies. Long viewed as fortresses of cooperating sisters, where relatives of the queen work for her benefit, Rudolph’s work demonstrates that non-relatives can become part of the colony — and potentially defend its residents and territory. Researchers were further surprised to find that, in some cases, fatal fights with thousands of casualties do not produce a distinct winner. Instead, colonies cease fighting and fuse together, with the queen of each colony still alive. How they know to stop fighting remains is a mystery, showing the need for research on recognition systems. One possibility, Rudolph says, is that fighting changes the odors ants use to distinguish nestmates from potential invaders. “If so, the updated or blended cues shared by prior foes may help end aggressive responses,” Rudolph said. Sorting out these processes could contribute to our understanding of an intriguing aspect of physical conflict — that animal combatants become more similar biologically through combat. That can be true for humans, too: A 2013 study showed that the skin bacteria communities of competing roller derby teams converge during bouts, not unlike Rudolph’s findings in ants. The Earth is constantly bombarded by high energy particles (protons, electrons and atomic nuclei) of cosmic origin, particles that comprise the so-called “cosmic radiation.” These “cosmic rays” are electrically charged, and are hence strongly deflected by the interstellar magnetic fields that pervade our galaxy. Their path through the cosmos is randomised by these deflections, making it impossible to directly identify the astrophysical sources responsible for their production. Thus, for more than a century, the origin of the cosmic rays remains one of the most enduring mysteries of science. Fortunately, cosmic rays interact with light and gas in the neighbourhood of their sources, producing gamma rays. These gamma rays travel in straight lines, undeflected by magnetic fields, and can therefore be traced back to their origin. When a very-high-energy gamma ray reaches the Earth, it interacts with a molecule in the upper atmosphere, producing a shower of secondary particles that emit a short pulse of “Cherenkov light.” By detecting these flashes of light using telescopes equipped with large mirrors, sensitive photo-detectors, and fast electronics, more than 100 sources of very-high-energy gamma rays have been identified over the past three decades. The H.E..S.S. (High Energy Stereoscopic System) observatory in Namibia represents the latest generation of such telescope arrays. It is operated by scientists from 42 institutions in 12 countries, with major contributions by MPIK Heidelberg, Germany, CEA and CNRS, France. Today we know that cosmic rays with energies up to approximately 100 teraelectronvolts (TeV)1 are produced in our galaxy, by objects such as supernova remnants and pulsar wind nebulae. Theoretical arguments and direct measurements of cosmic rays reaching the Earth indicate, however, that the cosmic-ray factories in our galaxy should be able to provide particles up to one petaelectronvolt (PeV)2 at least. While many multi-TeV accelerators have been discovered in recent years, so far the search for the sources of the highest energy Galactic cosmic rays has, so far, been unsuccessful. Detailed observations of the Galactic centre region, made by H.E.S.S. over the past ten years, and published today in the journal Nature, finally provide direct indications for such PeV cosmic-ray acceleration. During the first three years of observations, H.E.S.S. uncovered a very powerful point source of gamma rays in the galactic-centre region, as well as diffuse gamma-ray emission from the giant molecular clouds that surround it in a region approximately 500 light years across. These molecular clouds are bombarded by cosmic rays moving at close to the speed of light, which produce gamma rays through their interactions with the matter in the clouds. A remarkably good spatial coincidence between the observed gamma rays and the density of material in the clouds indicated the presence of one or more accelerators of cosmic rays in that region. However, the nature of the source remained a mystery. Deeper observations obtained by H.E.S.S. between 2004 and 2013 shed new light on the processes powering the cosmic rays in this region. According to Aion Viana (MPIK, Heidelberg), “the unprecedented amount of data and progress made in analysis methodologies enables us to measure simultaneously the spatial distribution and the energy of the cosmic rays.” With these unique measurements, H.E.S.S. scientists are for the first time able to pinpoint the source of these particles: “Somewhere within the central 33 light years of the Milky Way there is an astrophysical source capable of accelerating protons to energies of about one petaelectronvolt, continuously for at least 1,000 years,” says Emmanuel Moulin (CEA, Saclay). In analogy to the “Tevatron,” the first human-built accelerator that reached energies of 1 TeV, this new class of cosmic accelerator has been dubbed a “Pevatron.” “With H.E.S.S. we are now able to trace the propagation of PeV protons in the central region of the Galaxy,” adds Stefano Gabici (CNRS, Paris). The H.E.S.S. measurement of the gamma-ray emission can be used to infer the spectrum of the protons that have been accelerated by the central black hole — revealing that Sgr A* is very likely accelerating protons to PeV energies. Currently, these protons cannot account for the total flux of cosmic rays detected at the Earth. “If, however, our central black hole was more active in the past,” the scientists argue, “then it could indeed be responsible for the bulk of the Galactic cosmic rays that are observed today at the Earth.” If true, this would dramatically influence the century old debate concerning the origin of these enigmatic particles. After suffering a stroke, about three-fourths of patients exhibit some disability. The extent of a patient’s symptoms depends on the degree and location of brain tissue damage following the stroke event. This week in ACS Central Science, researchers show that by using a tailored small molecule to turn off the production of a key neuromodulator in the brain, they can dramatically reduce brain damage in stroke models in rats. By injecting a tailored new compound into the brains of rats, researchers can significantly reduce neuronal damage resulting from stroke. The treatment works both before and after the stroke has occurred. Credit: The American Chemical Society. The neuromodulator is the gas hydrogen sulfide (H2S). Its production is carefully controlled in the brain. After a stroke, levels of H2S appear to be elevated, leading to brain tissue damage, but the details of how that happens are still a bit of a mystery. So, David B. Berkowitz and coworkers designed a quick way to synthesize molecules they deduced would inhibit the production of H2S. They showed in vitro that these compounds block an enzyme called CBS from making H2S by mimicking one of its other products. Peter T. H. Wong and colleagues then tested the compounds in rats. When the new compound was injected an hour after the simulation of a stroke, the authors observed about a 70 percent reduction in the severity of the observed stroke damage. The results were even more striking with pretreatment. The authors conclude that using molecules like the ones they made will help researchers dissect the mechanism underlying H2S-mediated neuronal damage and will serve as an important starting point for the development of even more drug-like compounds that act in a similar manner. A change to a more challenging environment could, over time, re-ignite and grow old parts of the brain that have gone inactive, according to a study of army ants led by a Drexel biology professor. Sean O’Donnell, PhD, professor in the College of Arts and Sciences, studied several genera (groups of related species) of tropical army ants whose ancestors moved to living mostly underground almost 80 million years ago. The army ant species that continued to live underground appeared to have lost most, if not all, of their vision, but the genus Eciton appeared to gain back sight after returning to live on the surface about 18 million years ago. But some of the ants that O’Donnell and his research partners studied appeared to grow back parts of the brain used in seeing. It appeared to be a rare example of a species’ brain tissue increasing over time following a move to a more complex environment. 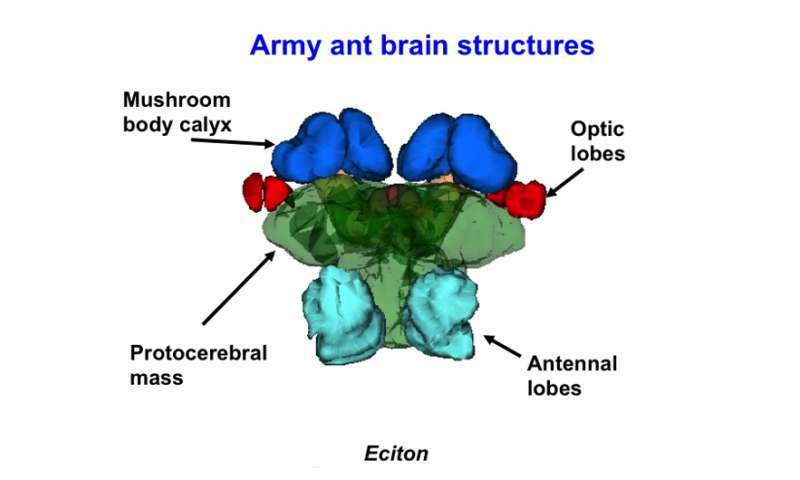 A diagram depicting the different sections of an ant’s brain. Credit: Photo courtesy of Sean O’Donnell/Drexel University. O’Donnell, along with four co-authors, recently published their findings in “Into the black, and back: The ecology of brain investment in Neotropical army ants” in The Science of Nature. In their study, the Drexel researchers found that the ants that lived mostly on the surface—Eciton hamatum, Eciton mexicanum and Eciton burchellii parvispinum—had significantly larger optical lobes, which are parts of the brain used in sight. Species in other genera that live mainly underground, like Nomamyrmex and Cheliomyrmex, had much smaller optical lobes. 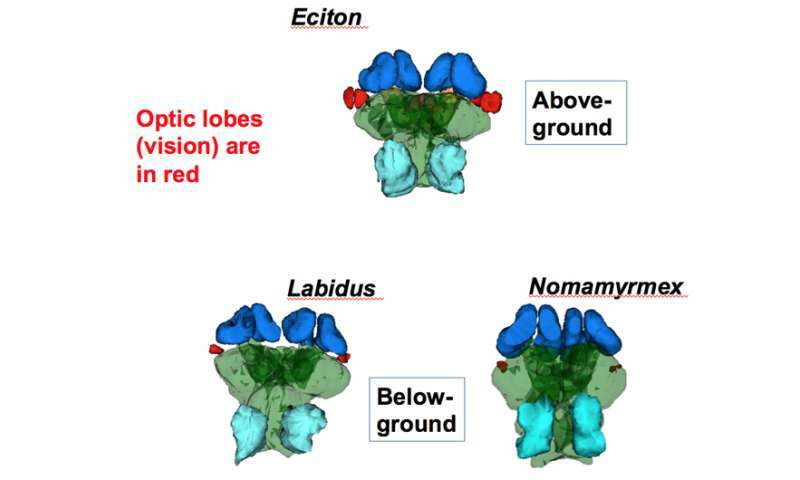 But other brain regions suggested that evolution of vision does not tell the whole story. A diagram comparing the optical lobes in the brains of above and below-ground genera of army ants. Credit: Sean O’Donnell/Drexel University. In addition to larger optic lobes, Eciton had the largest brain regions used in smell, and the largest brain size overall. In contrast, the mushroom body calyces—parts of the brain that are involved in memory and sensory integration—were found to be the smallest in Nomamyrmex and Cheliomyrmex, the most subterranean of the species the researchers studied. Together these patterns pointed to light not being the only factor dictating larger brains in surface-dwellers. In their paper, O’Donnell and the co-authors suggested a few aspects of the above-ground world that are more complex and require the evolution extra brain space: a diversity in prey, the presence of predators and the variation between day and night-time activities. “In the case of army ants, we know almost nothing about what behavioral and cognitive abilities are affected by increased brain region size, but our data suggest the army ants are an interesting group to explore these questions,” O’Donnell said. Having more brain tissue (also described as brain investment) is—genetically speaking —an “expensive” evolutionary trait. Brain tissue requires a lot of energy to build and maintain through the consumption of food. So a species won’t last long unless there is a good reason to carry that extra brain capacity. “This study shows that brains closely track animal species‘ ecology, and that brain evolution can respond to new ecological challenges even after tens of millions of years,” O’Donnell said.